Home » Foundation News » Mine Action News » Uncategorized » Laurier Lends A Leg! Would you #lendyourleg to raise awareness for the continuing impact of landmine contamination worldwide? 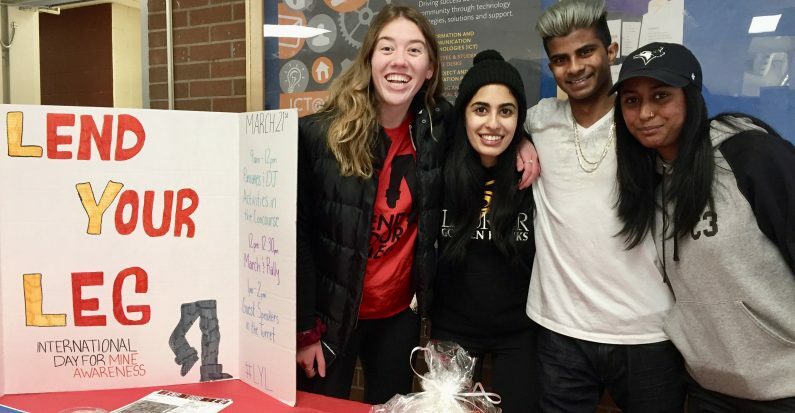 On March 21, Wilfrid Laurier University students organized the 7th annual ‘Lend Your Leg’ Day with help from the Canadian Landmine Foundation (CLMF) and Laurier’s Global Studies department. The event featured a pancake sale, interactive demining grid, campus march and rally, and speaker series. 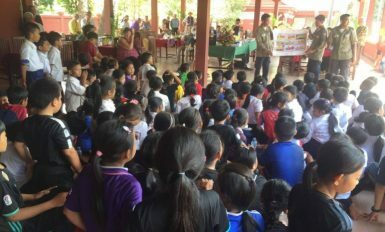 During the early 2000s, the ‘Lend Your Leg’ movement was the brainchild of the International Campaign to Ban Landmines (ICBL) and was spearheaded by former UN Secretary General Ban Ki Moon. Participants would roll up one of their pant legs to symbolize the harm caused by anti-personnel landmines. 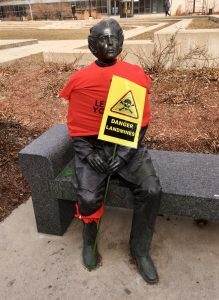 Today, Laurier students tied a red scarf around one leg, adapting the symbol to reflect renewed urgency as mine casualties rise around the world. 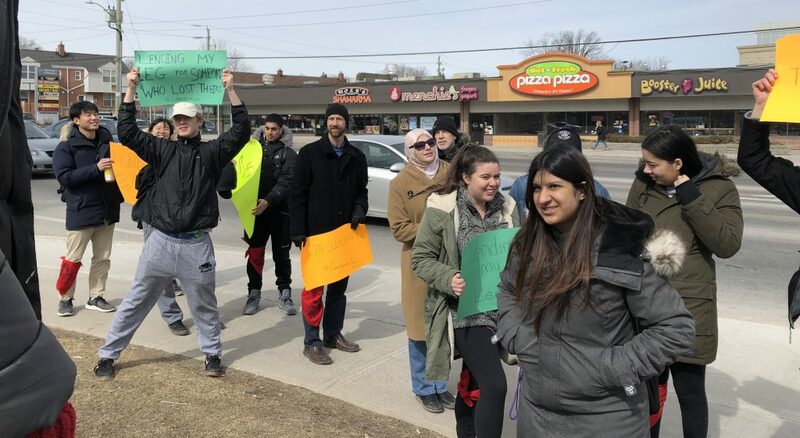 Chanting and singing, students waved signs and flags and marched across the Laurier campus from noon to one, before gathering in the ‘Turret’ for an educational speaker series on the state of mine contamination today. Alistair Edgar, CLMF President, brought greetings from Ottawa Treaty mastermind Lloyd Axworthy, before speaking about the continuing use of landmines by state and non-state actors in Myanmar, Syria, and Ukraine. 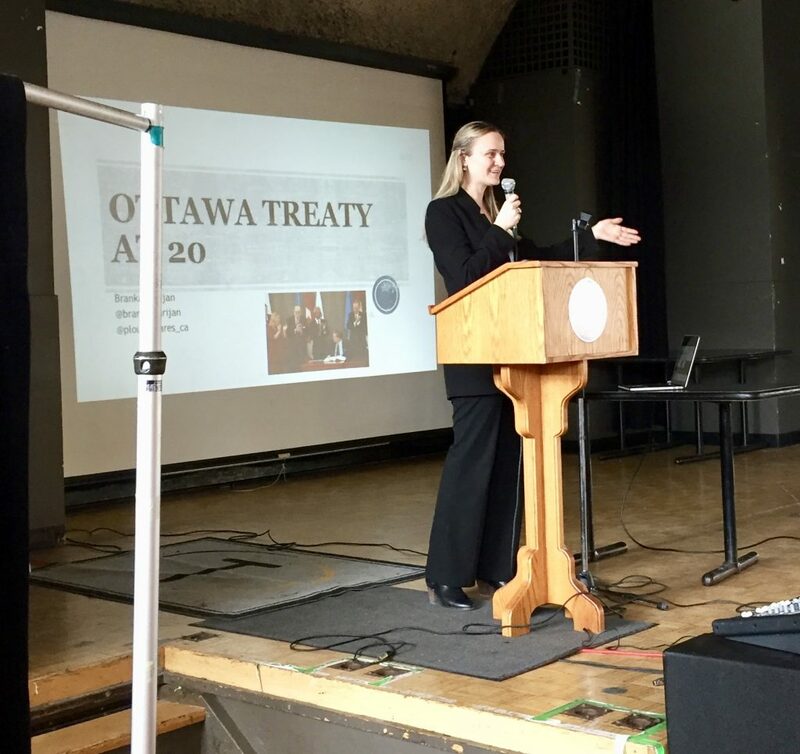 Edgar set the stage for Project Ploughshares researcher Branka Marijan, who argued that the Ottawa Treaty was the most significant Canadian diplomatic achievement of the last twenty years. Marijan also stressed the importance of the grassroots origin of the ICBL-led movement, and the remarkable ways in which ‘normal’ citizens helped achieve a global ban on anti-personnel landmines. She ended by observing that Canada has recently stepped back from the disarmament file, despite the continuing necessity of disarmament initiatives and regimes to the global community. Student organizers Anna Savic and Nikita Kumar were encouraged by the level of student participation, and expressed thanks to the CLMF and especially Edgar for his attendance and support. Students march down University Street. 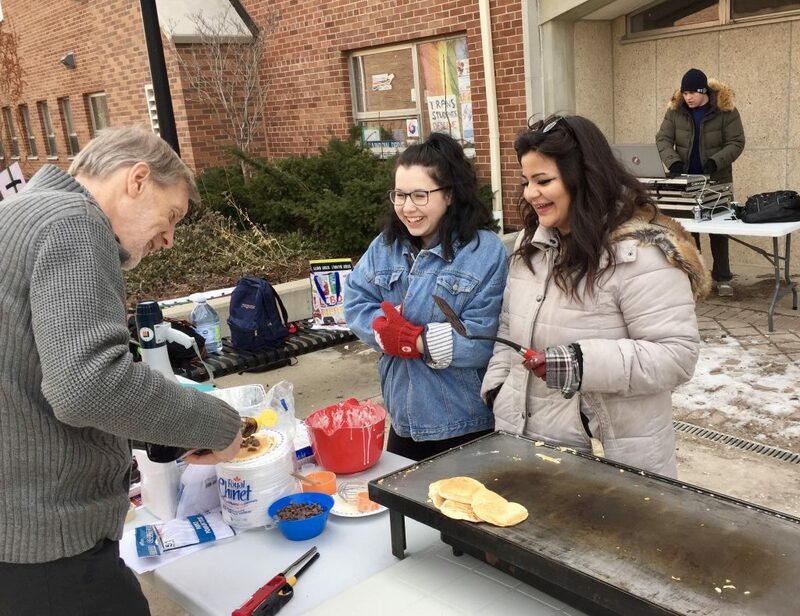 Laurier Global Studies professor Dr. Edmond Pries samples some pancakes courtesy of “Lend Your Leg” student volunteers. Project Ploughshares research Branka Marijan speaks on the importance of the Ottawa Treaty during the afternoon speaker series. 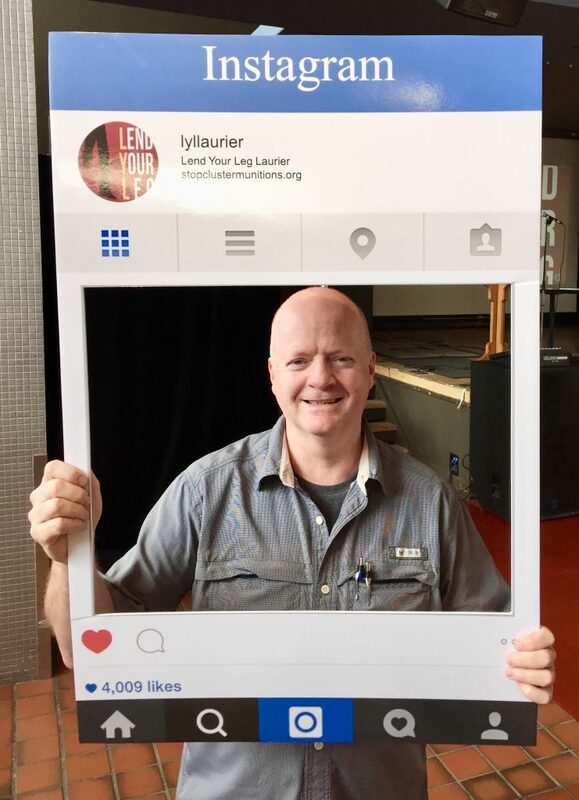 Canadian Landmine Foundation President Alistair Edgar tries out the “IRL” Instagram before kicking off the speaker series!